Part II of my favorites collection, posts that consist mainly of images. There is an arbitrary element here, since I decided to include only one cathedral, one Romanesque church, and so on. I wanted this post to give a sense of the range of things I like and have featured. Once it is ensconced on the right-hand margin in the favorites box I will probably rotate the posts. Van Gogh: The Drawings, March 27, 2015. I often love drawings more than finished paintings, and I am especially fond of Van Gogh's. Fantastic Images from the Dark Side, March 15, 2015. Vincent Munier, December 29, 2014. Amazing wildlife photographer. The Nearly Forgotten Realm of Sangxingdui, August 6, 2014. Strange archaeology from China. Strasbourg Cathedral, February 17, 2014. I had to choose one cathedral of the many I have posted; today for no particular reason I chose this one. Église Saint-Pierre-de-la-Tour d'Aulnay, August 19, 2013. And one from my array of Romanesque churches. India's Valley of Flowers, June 4, 2013. Lawrence Alma-Tadema, April 27, 2013. Victorian academic painting at its best. Sebastião Salgado, In Love with Planet Earth. Amazing images by the greatest living photographer. Andy Goldsworthy: Sticks. July 2, 2012. One of my favorite contemporary artists. Kabuto: Samurai Helmets and Masks, May 20, 2012. Over the years this has been my most popular image post. Greek Gold: Treasures of the Classical World. February 11, 2012. Art of the European Bronze Age, December 31, 2011. David Hockney, December 11, 2011. Perhaps my favorite contemporary painter. 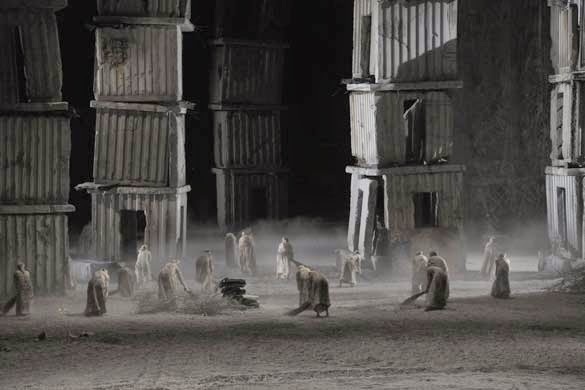 Anselm Kiefer's Tottering Towers. November 8, 2011.